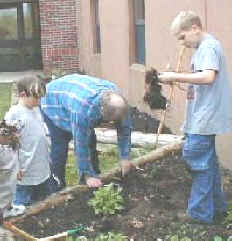 Mr. Brown helps Max and Michael clean-up garden beds. 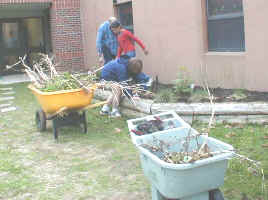 Students work together to clean out garden beds in Children's Garden. Sabrina, Evan, and Shannon pull out old sunflower stalks. 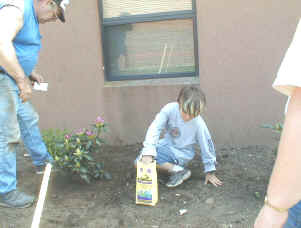 Max sprinkles aluminum sulphate around newly planted rhododendron to acidify the soil. 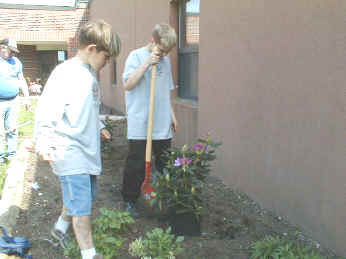 Max and Michael get ready to plant a rhododendron. Mary, Michael, and Max work together to shovel topsoil into wheelbarrow. 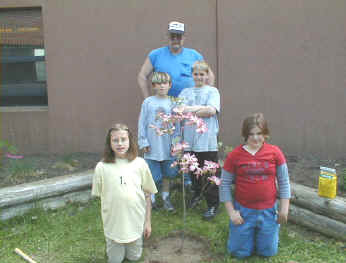 Garden Spirit members plant pink-flowering dogwood tree. 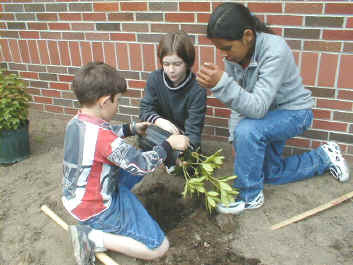 Max, Jackie, and Sabrina plant another rhododendron.